As someone who collects old photos of Phoenix, and posts them on the web, I most often see people who wish that the past would return. And unfortunately that's all they do. They say stuff like "I wish that Phoenix would be the way it was when I was a kid! ", and they're done. Other than a occasional rant about how much better it was before a particular road was built, or before a building was built, they never lift a finger. This makes me sad, as I know that these people could be the most important people to make the future of Phoenix better. So instead I focus on the people who are actually doing something. Yes, it's a tiny percentage, but they're taking the lessons learned from the past and doing things with the future in mind. I call these people "unrealistically optimistic" and those are the people who have built my city, and continue to do so. They remember a gentler, kinder Phoenix, with more trees, and more room for human beings and they're doing something about it, right now. Now don't get me wrong, I'm not saying that there's anything wrong about dreaming about the old days. I do it all of the time here in my imagination. But seeing photos of old Phoenix doesn't make me despair, or want to rant, it inspires me. A theme that I come back to over and over is how the trees of Phoenix all seemed to disappear after the 1960s. By the time I got to Phoenix, in the late 1970s, it was a very tree-less place, and I thought that it had always been, since it was a desert. But Phoenix is an oasis, and if you look at old photos you'll see the trees everywhere. Long before there was air conditioning, there was shade. There are a LOT of people in Phoenix, and it grows every day. And those people can make it better, or they can make it worse - it's their decision. I'd like to believe that I make Phoenix, and the world, better, by being here. Mine is an attitude of stewardship, Phoenix is my garden, not my trash can. If you believe that "everybody" is making a mess of Phoenix, then I recommend that you keep looking. 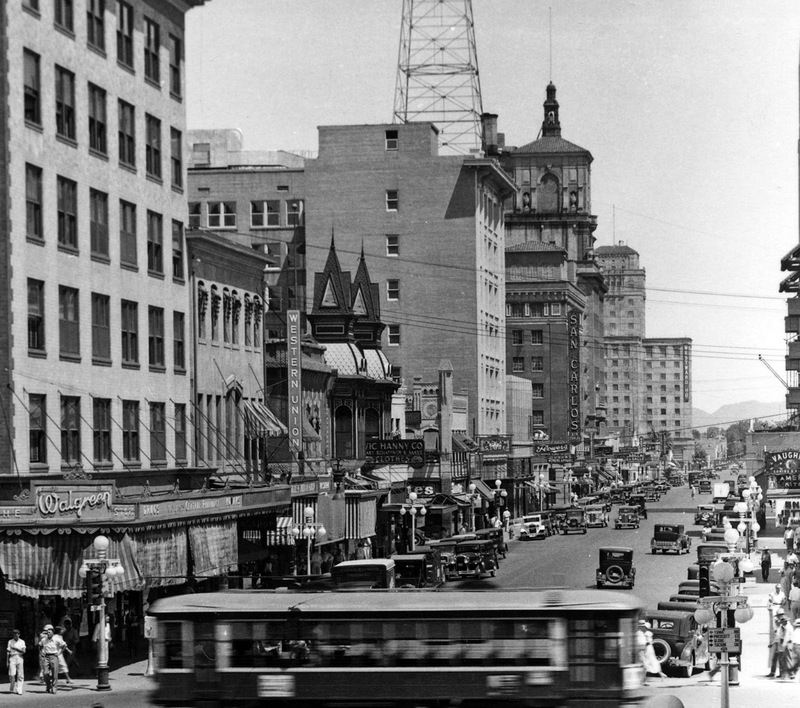 People made Phoenix an oasis, beginning in 1868, and it can be that way again. It's in your hands. Image at the top of this post: Looking north on Central Avenue from Washington in the 1930s, Phoenix, Arizona.